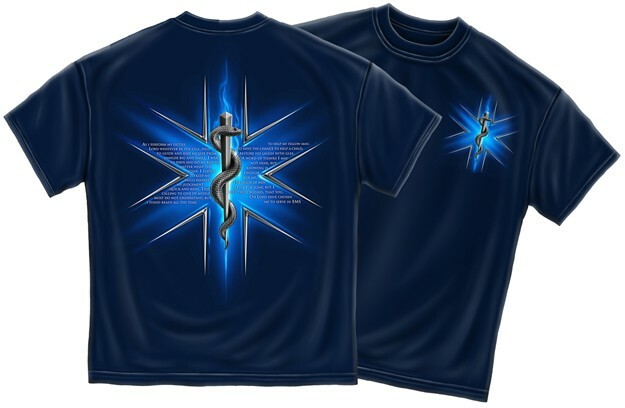 Show your pride with this EMS Prayer T-Shirt. [B]EMT PRAYER[/B]	As I perform my duties Lord, whatever be the call, help to guide and keep me safe, from danger big and small. I want to serve and do my best, no matter what the scene, I pledge to keep my skills refined, my judgement quick and keen. This calling to give of myself most do not understand, but I stand ready all the time, to help my fellow man. To have the chance to help a child, restore his laugh with glee, a word of thanks I may not hear, but knowing is enough for me. The praise of men is fine for some, but i feel truly blessed, that you, oh Lord have chosen me to serve in EMS.